This past Sunday, I participated in a small local 5k called Pawz by the Sea, and surprised myself by finishing 3rd female overall! What was so surprising about it? Well, this was my first running race in months, and given my 2-month break from running over the summer to heal my plantar fasciitis, and the fact that I haven’t trained to run fast in a very long time, this was a pretty unexpected achievement. Another win in my book – taking part in this race helped me get control over anxiety that’s been plaguing me for a while now. So this is where last Sunday’s 5k comes into the spotlight. To reintroduce the joy of racing back to my life, I made a decision to find a small, low-key race, and run it without stressing over the outcome. Luckily, a local animal clinic was hosting a 5k, and I found out about it a few days before the race. 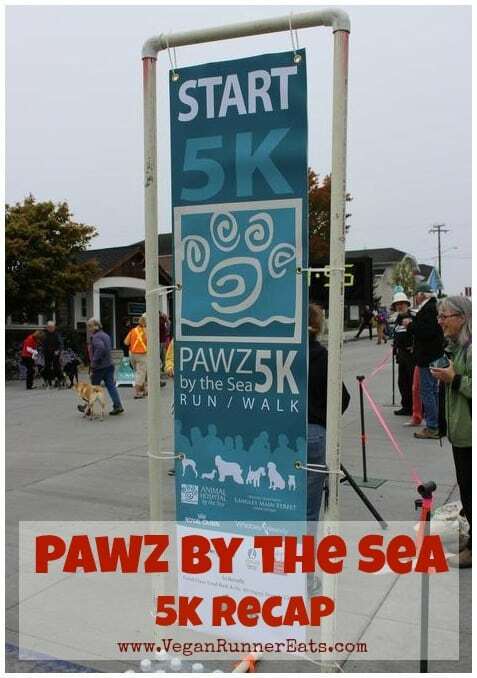 This 5k was supposed to be quite unique: the participants were encouraged to run with their dogs, hence the name ‘Pawz by the Sea’ (‘by the Sea’ part comes from the sea surrounding Whidbey Island). The night before the race, I finally made up my mind to participate in this 5k. I knew that it was going to be fairly easy: the distance was relatively short, and I was positive that the field would be small. I also decided to leave my GPS at home so that not to stress over my pace (I was ok with it being slower than all of my previous 5k’s) and just run by feel. 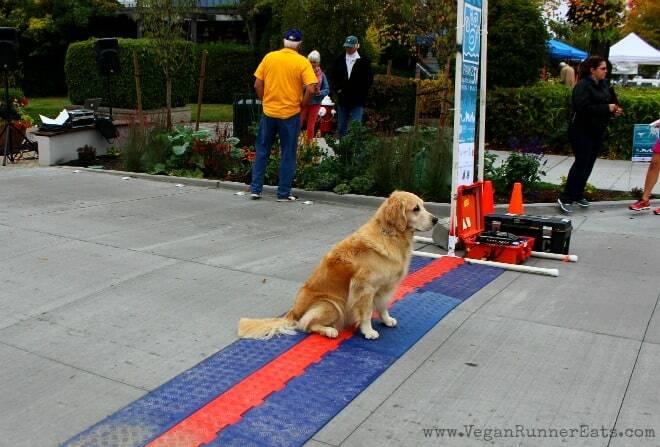 This guy could hardly wait to start the race! 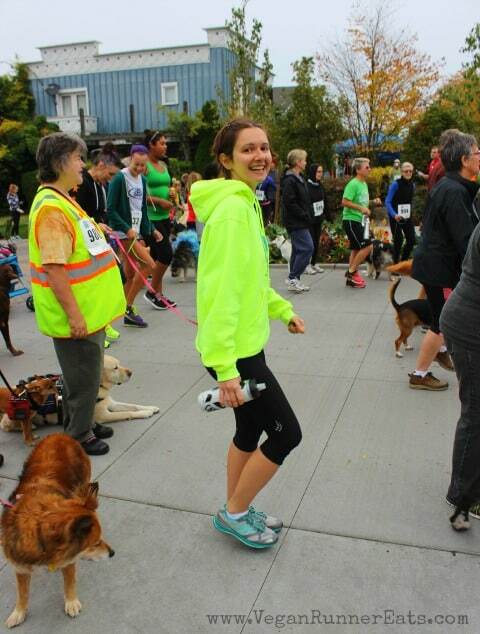 Once the race started, I took advantage of the fact that I was dog-less (no offense to those of us who regularly run with dogs!) and made it toward the front pack within the first half a mile. Three women – two of them with dogs, including the previous year’s winner – ran at a conversational pace that was just comfortable enough for me, so I stayed right behind them. Within a mile or so, I got closer to them, and we exchanged a few words. It turned out that they run together regularly, and know the course very well. They were surprised to find out that I just moved to Washington from Alabama, and after the race even invited me to join them for their Sunday group trail runs. When only a mile was left to go, one of the leading women dropped back, and I got in 3rd place. 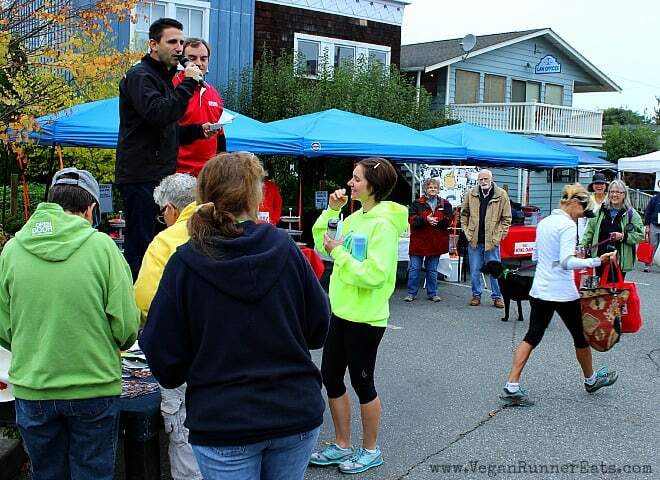 This race was giving awards to the first 10 male and female finishers, so I knew that I was going to score. Regardless of that, I decided against relaxing, and gathered all of my strength to speed up (or at least it felt so). I crossed the finish line in just under 26 minutes. I knew that it was my slowest 5k to date, but brushed away negative thoughts and chose to enjoy my 3rd place. The endorphins were rushing through my system – I think Rob enjoyed seeing me so elated! We stayed to cheer up the rest of the field as people and their dogs approached the finish. It turns out that Oliver and his owner are regulars at this 5k. While his owner mostly walks, Oliver often makes it hard for her to keep up with him! 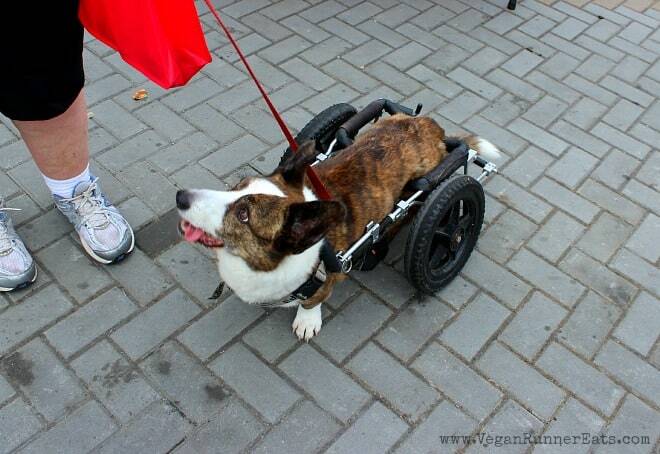 Seeing this handicapped dog filled with life and joy put things in perspective for me: there are plenty of less fortunate living beings who still manage to live their lives to the fullest, so my time limitations are not an excuse for me to complain. To sum things up, this race turned out to be a cathartic experience. I managed to leave behind the anxiety of wanting to perform at my best, and just enjoyed the opportunity to run well and meet new people. I also realized that I am blessed with so many amazing things in my life – being able-bodied, having lots of amazing opportunities, and most importantly, being married to my wonderful and supportive husband who took all of these pictures! – that there’s no room left for complaining. If we take a look at our troubles from a different perspective, we’ll see what we haven’t noticed before. Question for you: What was the last experience that made you count your blessings? Stay in touch with Vegan Runner Eats by subscribing in the top right corner of this post, or by following my blog on Facebook, Twitter, Google+ and Instagram! 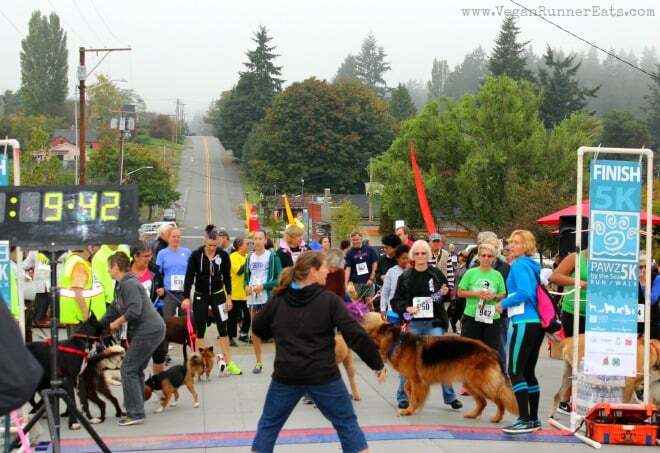 Tagged animals, race recap, running, running community, Whidbey Island. Bookmark the permalink. Thank you for being so open about the anxiety, in our go go go world today it is easy to forget about all the things in our lives to be thankful for – the last experience that made me count my blessings was my last job – working in a call center for a large financial institution – listening to people in desperate financial situations many times over – it wasn’t the job for me but it definitely reminded me how much worse it could be. Now I’m at a new job which is an adjustment and about as far from plant-strong as could be – so I’m adjusting to the new environment and trying to maintain an attitude of gratitude. 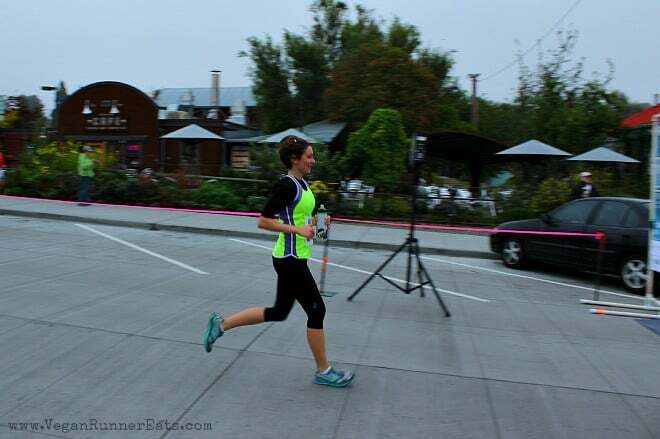 I ran one 1/2 marathon a year and a half ago – it was a VERY cathartic experience for me. Debbie, thank you so much for your kind words! Glad you enjoy reading my blog. I consider myself a quite grateful person on a daily basis, but sometimes it helps to get a reminder of what this life is all about. If I ever worked at a call center of a financial institution, I would have probably lasted only a few days because I emphatize with people too much! Wow Heidi, thank you! Glad you’ve found my blog! It’s awesome that your husband decided to go on a run with you – I was thrilled when my husband finally got a gym membership recently after I’ve nagged him about it for months telling how good it would be for his health!